Photo submitted by Steven Moore Steven Moore, 25, of St. Clairsville, Ohio, plays his banjo, which is what he will be doing during the Brick Street Arts Bash this weekend in Marietta. Photo submitted by David Griesmyer Welding artist David Griesmyer, 38, of Malta, Ohio, stands on top of his 20-foot fish that will be displayed this weekend at the Brick Street Arts Bash in Marietta. Photos by Peyton Neely Todd Morrow, 55, a sculptor with Resolve Studio, works on the mural backdrop that will be painted by children during the Brick Street Arts Bash on Saturday. MARIETTA — David Griesmyer is bringing his 20-foot-long fish sculpture and Steven Moore will be playing contemporary folk music with his banjo on Saturday. These are just a couple of the artists, musicians, actors and dancers that will flood Putnam Street on Saturday for the first Brick Street Arts Bash. Hosted by Marietta College’s Music Department, individuals and groups are coming from all sectors of Ohio and beyond to showcase their talents on this special day. From 10 a.m. until 10 p.m., the public can enjoy interactive art experiences and performances at no cost to them. “Rain or shine we will be having the event,” said Marietta College’s Music Department Chairman Marshall Kimball. The day-long celebration of the arts and arts education in the Marietta community is for everyone in the region. Live music will be performed at the Peoples Bank Theatre and at outdoor stages at Front and Putnam streets and Second and Putnam streets. Griesmyer is a 38-year-old industrial artist who learned how to make sculptures by welding. After attending the Washington County Career Center and completing the welding program, Griesmyer said he found a new way to create art. The first sculpture that Griesmyer ever created was a man welding that the career center still has. 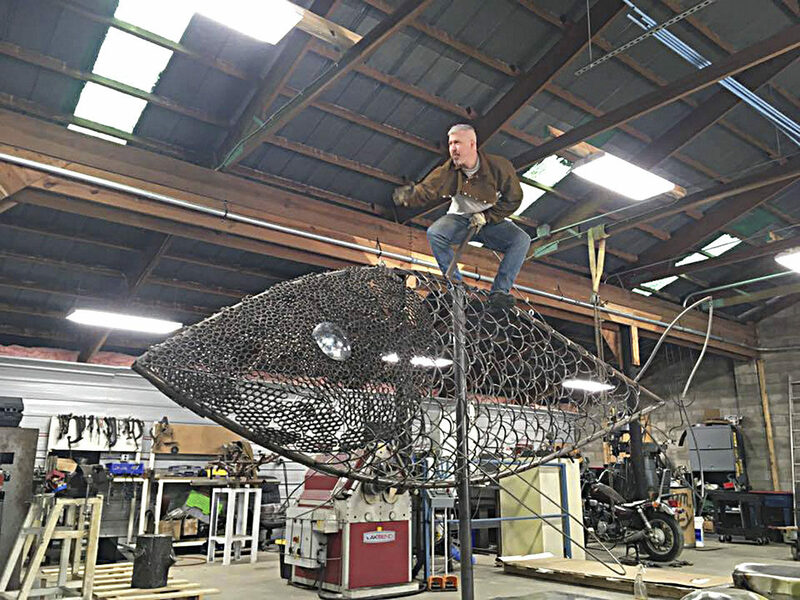 Griesmyer will be bringing one of the first sculptures completed for the project, a 20-foot-long fish, with him to the festival Saturday, along with several others. Griesmyer said he is excited to be a part of a new arts festival in Marietta. “I love Marietta and I’ve always wanted to be a part of Marietta since I am now part of Southeast Ohio,” he said. 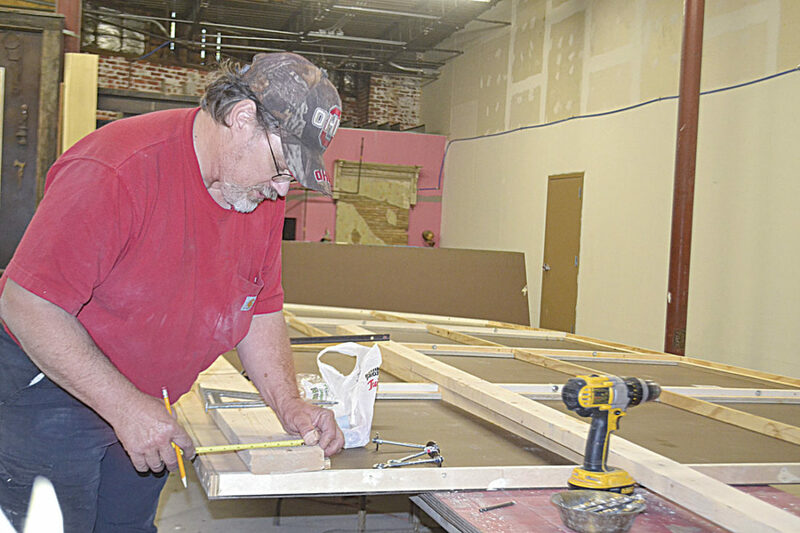 Geoff Schenkel, 45, of Marietta, will be displaying a 20-foot-wide by 8-feet-tall mural that will be painted by students from the Boys and Girls Club of Washington County and Harmar Elementary School. “Wilyum Huffman is the graffiti artist from Parkersburg that we are going to be working with to create this work of art,” he said. Students working on the project will be able to come and go on Saturday viewing the work-in-progress. At the end of the day on Saturday, Schenkel said, the mural will go back to the Boys and Girls Club where it will be included in programming throughout the summer and the fall. “We don’t want to let the cat out of the bag with what the mural will look like yet so people will just have to wait and see on Saturday,” he said. 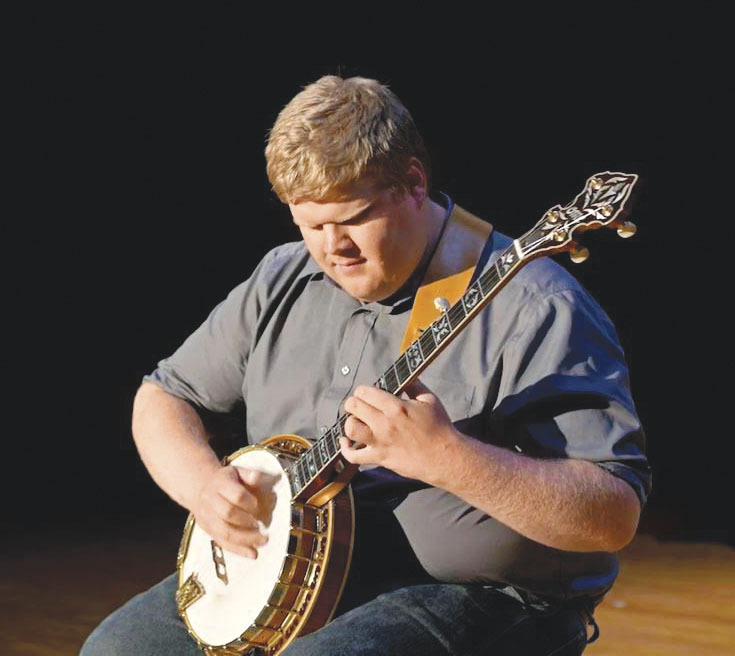 Meanwhile, Moore, 25, of St. Clairsville, Ohio, is bringing contemporary folk music with his banjo to the stage on Saturday. As a graduate of Marietta College, Moore worked with the jazz band at MC and is excited to be invited back to play. The Escher String Quartet, an American string quartet based in New York City, will be taking the stage Saturday. The Transit Arts, Dance, and Music is venturing down from Columbus to perform on the Second Street stage at noon and professional actress Carolina Alvarez will be performing two one-woman theater shows. There are expected to be several food trucks on hand for the festival, including B&M Hot-Dog stand, Lisa’s Sweet Stop, Uncle Dan’s Old Fashioned Ice Cream, Rubin’s Deli, D&D Concessions and DIK & KS Concessions. Several blocks of Putnam Street will be closed to traffic for the event. Kimball anticipates those intersections to be closed from 6 a.m. Saturday until at least 7 p.m. that evening. All of Putnam Street will be closed until later Saturday night.